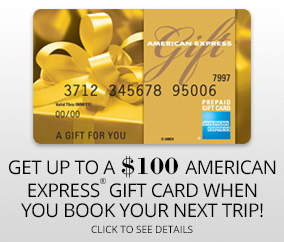 Book a vacation valued at $500 or more to receive a $50 American Express ® gift Card, or $1000 or more to receive a $100 American Express Gift Card, good for use virtually anywhere American Express is accepted. From a simple treat to a big splurge, it’s the perfect way to celebrate a wedding, birthday, anniversary, or the holidays! A qualifying vacation is a purchase valued at $500 or more per booking (taxes not included) and purchased through the Travel + Leisure Family Club. The Gift Card will be mailed to active T+L Family Club members 4-8 weeks after date of booking. T+L Family Club reserves the right to withdraw or alter this benefit at any time without advance notice.